Process flow charts (often referred to as process flows) are easy to understand diagrams or pictures of how the specific steps in a procedure or process work. Mapping out a process helps the owner identify where improvements can be made. They are particularly helpful in showing where too many people are involved in a process and where additional reviews may be needed. 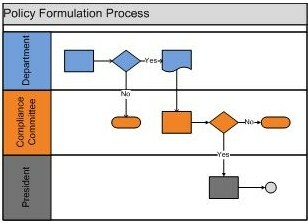 Since a process flow is a visual representation they are also a useful training tool. Flow charts generally use swim lanes (the horizontal groupings) and symbols (the rectangles, diamonds, circles, etc.). Symbols are connected by the use of arrows indicating the direction in which the process flows. Contained within each symbol is a written description of the activity represented by that symbol. Care should be taken to keep flow charts simple, the more swim lanes and symbols that are used the harder it is to follow a flow chart. Always keep your audience in mind when developing flow charts. It is important to come up with common definitions of the symbols and to make them available to all potential users. Organizations should develop flow charts that fit their needs keeping in mind that there are some standard rules that should be followed. Prudential Bank needed a more efficient Project Management process. They were overwhelmed with the number of projects in their pipeline. I was asked by the President of the Bank to build a Project Management Office. As part of this process I created a simplified project management process and forms for use in managing projects. All employees of the bank needed to be trained in the new project management process. I developed process flows which were visual representations of how the new process worked that were used in employee training. Are you ready to get started on your Process Flow Charts? An initial consultation is only $100. Here is what you get. The $100 fee is applied to the cost of developing your Process Flow Charts if you decide to use Jackie Willey. Jackie Willey is available for a free 30 minute consultation to discuss your Process Flow Charts and help you develop the best strategy to meet your needs.